Giorgio Armani’s Luminous silk foundation is the only foundation I have re-bought. When I read any negative reviews for this I have to assume that the person was doing something wrong. I will start with the texture. It is exactly as the name suggests, it feels like silk. The color range is excellent. They have even added a couple more colors to the list. At first I was dismayed at the colors a...read mores when I swatched my face none of the colors seemed to match, but because I wanted to try this so much I let the SA pick out the color for me. Once home with the product I tried it right away…. of course! The color I swiped was still what I thought off. But must give it my best shot. I dotted the formula on my face and blended with my fingers. Once blended I was quite surprised, it indeed melded with my skin so well that the color was perfect. So do not panic at a swatch test. Once you blend it on it is sheer so the color is much more subtle. 184 A lot of people like to apply this with the foundation blender brush and some prefer their fingers. The video on the Giorgio Armani web site shows it being applied and blended on the face beginning at the center of the face and blending out towards the outer portion of the face. This should be true for all liquid foundations. Once it has been blended on with the brush the make up artist uses his fingers to go over it softening still further. It was said that by using the brush you use a lot less product and some reviewers have said the same thing. 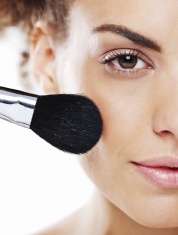 105 My experience of the application of and blending of the product is this: Since I had the brush I used it first. Then I tried it with my fingers alone. I looked closely to compare the two different applications. The over the next two weeks I switched back and forth between the 2 methods and examined the outcome each time. I did this because I wanted to get a good perspective of the difference, if any. The results: with the brush method the foundation goes on a bit more heavily and with the fingers it is sheerer. Both methods were done by starting at the center of the face and blending out. Now by heavy I do not mean thick and mask like by no means. Both finishes are beautiful. If it is to sheer just go over it again with whatever method you prefer. It can be built up very easily. My choice of application that I use most often is with my fingers. Also I do not put it all over my face. I squirt out a bit on my hand or finger and dot it lightly over all the spots I wish to cover. I apply under my eyes and blending into the skin of my cheekbones. Then I apply it around my nose and on any darkened sunspots and the corners of my mouth. Then I go over the same areas as needed. I use the brush occasionally for fun as I do enjoy playing with the tools. 76 * 154 +22 Now here is something to consider. The foundation comes in a pump bottle, so releasing too much product can be easy until you get the right grip on the bottle and feel how much pressure to exert on the pump. I use the tiniest bit and never end up wasting any product. If you use the brush method you will use up more product. So how much you use will depend on your application choice and the pressure on the pump. One bottle will last me a year. Not so expensive for me with the way I use it. 198 The final analysis: I am always amazed (yes still am after 5 years) at how fine and natural my skin looks. How can it change so much with such little product. But wow can I see a difference. It is unlike anything that I may try as sampling other foundations here and there. My skin just looks beautiful. It never is dry looking yet never, even at first to moist. How this works I have no idea but I don’t care how as long as it does! Would I purchase this again? Duh…already have 5 times! For those of you that have trouble with it I firmly believe it is in your application technique. Give it a chance and go over this review and you may just find the right technique for yourself and then instead of being disappointed you will be amazed…. and that is a wonderful thing. 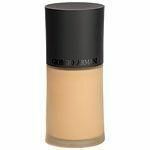 This is my favorite foundation. The 475 color matches me perfectly (I'm an NW22 in MAC for reference) blends beautifully and it doesn't oxidize. It also lasts all day. It is great coverage without looking like you just piled makeup on your face. It is a bit expensive, but it is my only 10 star foundation to date. It does match up to the raving reviews. At first I wasn't sure but with using the Beauty Blender sponge it goes on effortlessly and flawlessly. It really does give your skin a silk seamless finis and you don't have to use much at all. A little goes a long way! It isn't dry or oily. The perfect balance. I'm combination/normal skin. I prefer something that is more hydrating as to give me a glow. But...read more not too much that that my face looks oily. This foundation provides the perfect balance. Great staying power but not difficulty to remove.